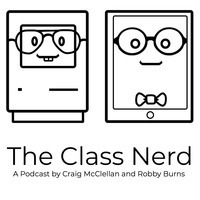 The Class Nerd - What is The Cloud and Why is it Important in Education? What is The Cloud and Why is it Important in Education? As I was planning out content for this blog, I noticed a common theme kept arising through all the tools I use regularly: the cloud. Cloud technology is a phrase that is thrown around a lot by technology companies in advertisements and product launches, but often times they assume you already know what that means. I thought it might be good to explain what the cloud is, and why it is important for both teachers and students to understand it. On any computer or mobile device, files and programs are stored on a hard drive inside the device. This space is limited by the capacity of the hard drive, and information is often only accessible by the machine it is on. “Cloud computing” is a term for a hard drive or server stored at a remote location, accessible by a data connection. Because of this, storage is virtually limitless, files can be retrieved on any device, and collaboration and sharing are easier. It’s like your data is stored in a cloud above your head that can always be accessed. The most basic implication of the cloud is files can be synchronized with any device automatically. This is a crucial function of several apps that I use because I have a Mac, an iPhone, and iPad. When I pull up the calendar on my Mac, I don’t want to have to worry about whether or not all the entries I recently added on my iPad have been synced or not. With Apple’s iCloud, I don’t have to. If I start a paper for grad school on my Mac, but have an idea for it while out running errands, I can put that in on my iPhone or iPad. This allows for a new level of productivity that was previously unavailable. Keep school reading assignments synced across devices so you can do them any time you have a few minutes free, regardless of what device you have with you. Capture ideas on the go, and process them later. Get work done on your personal computer and have it sync to your work computer (since most public schools do not offer great computers to teachers). While synchronization is an important part of cloud computing, where the cloud gets really interesting for education is in collaboration. With data stored at a remote location, it is easy to grant others access to it. Dropbox is a great example of a service that offers synchronization and sharing. If I upload a picture from my iPhone to dropbox, I can immediately access it on my Mac or iPad as well as share that file with a friend. Taking this concept a step further, Evernote has a product called Evernote Business that allows for greater sharing within a company or team. If Evernote is essentially a digital filing cabinet, Evernote Business gives everyone access to these files. The implications of this in education are huge. Teachers can share lesson plans and ideas with the rest of their team automatically. Student portfolios can easily move with a child throughout his or her time at the school. The cloud has also led to a rise in Web Apps where actual software is stored in the cloud and accessible anywhere. This means multiple people can access a file and edit it simultaneously. Two great examples of this are Apple’s iWork for iCloud and Google Docs. Both of these suites of apps have a word processor, spreadsheet program, and presentation creator. These are great for group projects because everyone in the group can edit the file at the same time, but on their own computer. Web apps are also great for a school’s IT department because the software automatically updates. They don’t have to spend time making sure hundreds of computers are all running the latest software versions. Schools can therefore have more current technology with less cost to them. One issue with the cloud that everyone should be aware of is security. With data stored on a remote server, it is important to select cloud services that make security a high priority. This is especially important is student information is stored there. No service is completely invulnerable to hackers, but neither is any computer. My recommendation is to always use strong, unique passwords, and only use services that offer 2 factor authentication. 2 factor authentication means when you log into a service on a new device, it will contact you via a known device (usually your phone) to make sure this new login is legitimate. So just because someone knows your password, doesn’t mean they will be able to access your data. 2 factor authentication is becoming more and more common, and is often an option you can turn on in your service's preferences. With personal and student data at stake, this is an easy and important step to take. Are you using any cloud services in your school or personal studies? If so, which ones? Let me know in the comments.